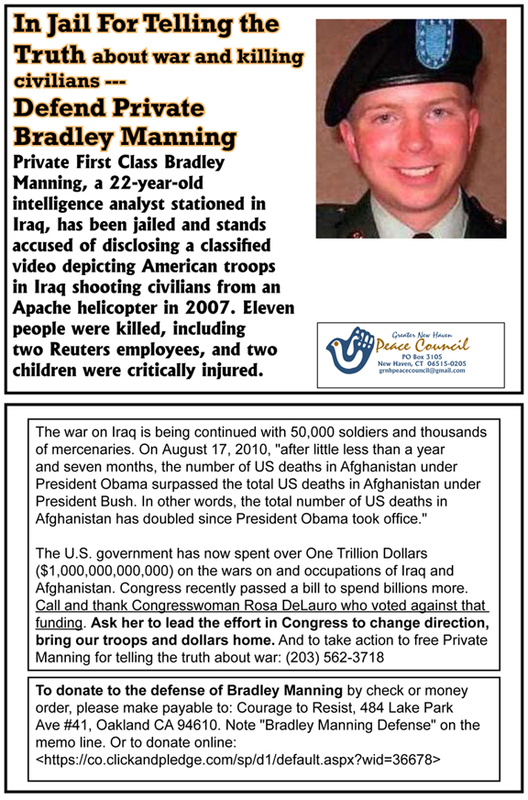 A front for the Communist Party USA, the Greater New Haven Peace Council, is campaigning in support of jailed, accused, WikiLeaks official document thief and "leaker, " private Bradley Manning. The Greater New Haven Peace Council is an affiliate of the U.S. Peace Council, which is in turn affiliated to the planet's most active international communist front, the World Peace Council. The man in the photo below, holding the "Defend Private Bradley Manning sign" is Al Marder, a long time leader of the Greater New Haven Peace Council. Comrade Marder has been a member of the Communist Party USA since at least 1952 and in recent years has been a member of the Party's "Peace and Solidarity Commission". 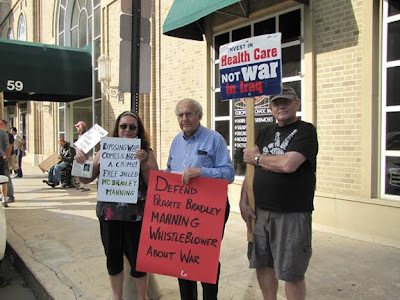 Note the mention above of Democratic Congresswoman Rosa DeLauro, a very close friend of Al Marder's Connecticut Communist Party. In June 2010, Alfred Marder addressed the Disarm Now! Conference, Riverside Church, New York. as president of the International Association of Peace Messenger Cities, vice president of the World Peace Council and president of the U.S. Peace Council.